After evaluating 32 diets, including the Atkins diet, Jenny Craig and Slim-Fast, a panel of nutrition and diet experts concluded that Weight Watchers was the easiest plan to follow and the one most likely to result in successful weight loss. All foods are assigned a point value. To lose weight, you'll need to stay below your total points target each day. The average Weight Watchers member starts with 31 points per day and 49 extra points to use throughout the week. A balanced Weight Watchers meal plan will fulfill these points with low-fat, nutrient-dense foods. Talk to your doctor if you're having trouble developing a personalized weight-loss menu. 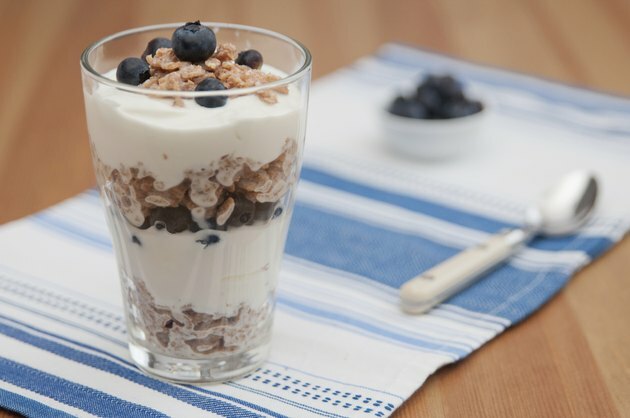 A typical 7-point breakfast on Weight Watchers could consist of 1 cup of plain oatmeal prepared with water and sweetened with 1 tablespoon of jam, 1 cup of nonfat cottage cheese and an apple. On the diet, all fresh fruits are considered free foods -- they have a value of zero points. Other options could include cooked quinoa mixed with honey and low-fat milk for 5 points or a slice of French toast casserole for 6 points. A cup of black bean soup and 1 cup of pasta tossed with 1/2 cup of cooked beans like white beans, chopped tomatoes and crumbled feta cheese could serve as a 13-point lunch. Weight Watchers offers nutrition information about different types of commercial products like canned soup to help you choose the ones that are the healthiest and have the least points per serving. Try an Asian chicken salad -- 4 points -- or a turkey and cheese wrap providing 6 points for a lighter lunch. You might have 3 ounces of grilled pork tenderloin, chopped vegetables like onions or tomatoes, nonfat cheese and nonfat sour cream wrapped in a whole-wheat tortilla for dinner. This meal contains approximately 7 Weight Watchers points. Chicken chili, baked salmon or a turkey burger, all of which supply around 5 or 6 points, are also good dinnertime choices. Vegetables steamed or roasted without added fat have a zero point value and can be added to your meals to boost nutrition and help fill you up. Use snacks with a low point value to prevent hunger throughout the day between meals. While you can have anything you want, it's healthier -- and will use up fewer points -- if you steer clear of typical high-fat, high-sodium snack foods and make nutritious choices. Fresh fruit and raw vegetable sticks are an obvious choice, but you can also have 1/2 cup of nonfat ice cream, six crackers like saltine crackers, baked sweet potato chips or onion rings, or a fruit parfait made with yogurt, fresh berries, whole oats and nuts. Each of these snacks contains 2 Weight Watchers points.